Experiencing a loss is difficult, so imagine telling your personal or commercial lines client their claim won’t be paid because of a simple mistake. That’s a conversation every agent wants to avoid! When you follow these tips, you can help ensure your client will be less likely to experience any unwanted surprises, and you’ll build credibility as a reliable agent. 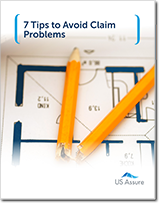 Complete the form now to access our free resource, and learn steps to avoid unpaid claims and unhappy clients.